Directed by John Carney, Once is a fairly clever romance title with a healthy dose of music which involves two lost and lonely souls. 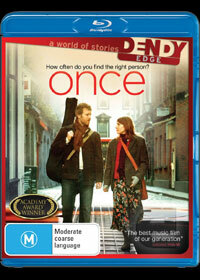 The main protagonists of the movie include Guy (Glen Hansard) and Girl (Marketa Irglova). Guy plays a struggling busker in the streets of Dublin who meets Girl, a beautiful Czech girl who is working as a cleaner but is also a master pianist. As both are caught in the doldrums of life, unable to move, they discover that they both have a common interest and that is music which seems to transcend their communication issues. This hereby begins a beautiful tale, more specifically a musical about two star crossed souls who once again begin to see the world as it is. Together they attempt to work out their problems with music with an aim of starting Guy's music career. Beautiful cast, Once also features some great cinematography of Dublin that only highlights the music of this film. Of course, the star of this film for me was Marketa Irglova as Girl who is remarkable likeable and quite realistic in performance that only adds to this endearing story. Although the video quality of this production may not be comparable to current Hollywood blockbusters, it's the audio which shines once the music begins and will only assist in drawing you into this world which begins with two lost individuals who then blossom once their partnership is secured.